Arlington, VA, October 16, 2012 – PBS KIDS series WILD KRATTS has seen an increase in average audience since last season, and will build on that success this month with new science-focused episodes and online content. WILD KRATTS’ average audience for kids 2-8 is up 30 percent season-to-date above its 2010-2011 season-to-date average. * The popular series will continue this momentum with new episodes this week, followed by four more premieres during “Weird Kratts Week,” October 22-26, and a new spidery Halloween episode on October 31. WILD KRATTS is PBS KIDS’ newest science-focused series, part of the media organization’s commitment to STEM (science, technology, engineering and math) learning for young children. “PBS KIDS aims to foster the spirit of exploration in all children through content that is both fun and educational, and WILD KRATTS is a landmark series in supporting our mission,” said Lesli Rotenberg, Senior Vice President, Children’s Media, PBS. “We’re thrilled to see more and more kids and parents responding to the series, which takes viewers on wildlife adventures and teaches core science concepts like physics and biotechnology along the way.” WILD KRATTS also just launched Creaturepedia, an online animal encyclopedia that includes information on each animal’s creature powers, diet, geographic location and more, as well as video content, available on PBSKIDS.org/wildkratts. Produced by the Kratt Brothers Company and 9 Story Entertainment, WILD KRATTS transforms Martin and Chris Kratt, creators of the award-winning KRATTS’ CREATURES and Emmy-winning ZOBOOMAFOO, into animated versions of themselves, allowing the real-life zoologists to visit wild animals in their little-seen habitats and showcase key science concepts along the way. Geared towards kids ages 6 to 8, each episode of WILD KRATTS presents age-appropriate science inspired by the natural abilities of the animals that the Kratt brothers – and young viewers – meet. The series premiered on PBS KIDS in January 2011. 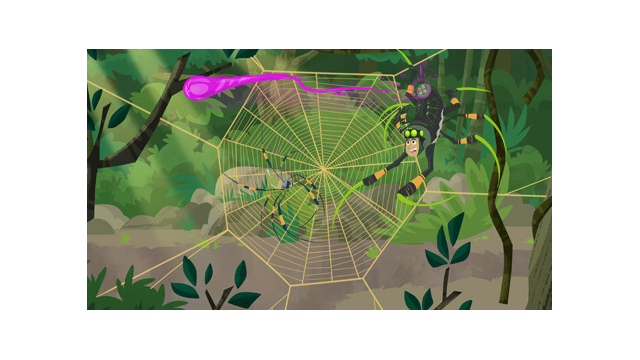 A full listing of new episodes of WILD KRATTS premiering in October follows. Images of WILD KRATTS and additional information about the series are available on PBS PressRoom, and screeners are available upon request. October 16, 2012 - #202 “Race for the Hippo Disc” When Chris and Martin accidentally lose a Power Disc on the African savannah, the Wild Kratts go into crisis mode to find the disc before it gets into the hands of Zach Varmitech. Science Concept: Territoriality. October 17, 2012 - #203 “Creature Power Challenge” After getting caught in the middle of a tussle between a grumpy rhino and an outraged elephant, Martin and Chris decide to have a contest to decide what are stronger – elephant or rhino powers. Science Concept: Animals have adaptations for where and how they live. The Kratt brothers’ sub loses power while they are exploring the strange landscape of the ocean depths and they are trapped on the ocean floor. Aviva must figure out how to harness the energy from the deep sea’s hydrothermal vents in order to save the brothers and return them to the surface. The WILD KRATTS team learns all about the amazing process of chemosynthesis and how deep sea creatures transform toxic chemicals into energy. With a little help from the Yeti crab, Martin and Chris are able to capture the this energy and use it to restart the amphi-sub and return to the surface. Science Concepts: Chemosynthesis; how special deep sea creatures transform such toxic chemicals into energy. October 23, 2012 - #133 “Gecko Effect” There’s a mystery to be solved, as the WILD KRATTS team wonders how a Gecko lizard climbs up smooth surfaces and can even climb upside down. The gang uses the Miniaturizer to shrink and discover it’s all about physics. But in the meantime, Zach has stolen their Miniaturizer and now imprisons them in a glass terrarium. Martin and Chris activate the new Gecko Powers of their Creature Power Suits and must retrieve the Miniaturizer before Zach shrinks all the animals in the creature world. Science Concept: Physics - Objects have electrical charges that attract one another. The gecko's toe pad structure enhances these charges so much that they can “stick to” smooth surfaces.